It's time for our baseball quiz: Relief Pitcher or Dude in a Band? It’s a spring training tradition unlike any other. The Yahoo Sports video crew walking around Cactus League ballparks and quizzing fans in our favorite game: Relief Pitcher or Dude in a Band? 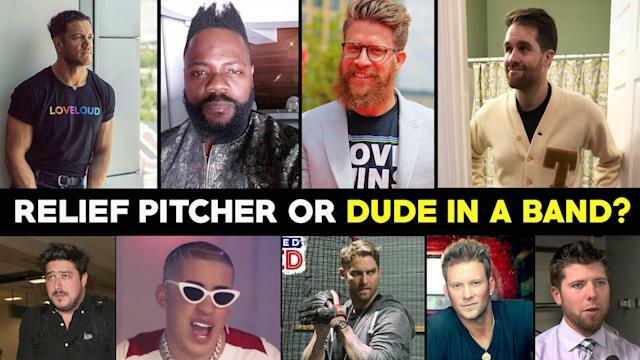 Armed with an iPad and pictures of people like Sean Doolittle, Bad Bunny, Brian Kelley from Florida George Line and Fernando Rodney, we quizzed baseball fans on whether they can tell the difference between a relief pitcher and a musician. Sometimes, they look quite a bit alike, you know? It’s quite hilarious to see how people try to figure out who’s who — whether we’re talking about beards, muscles, watches or necklaces.